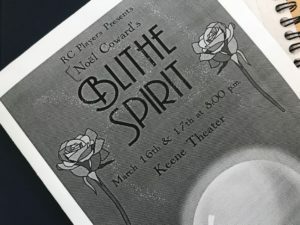 This play was certainly blithe and spirited! From the beginning, it evoked laughs with playful foreshadowing, miscommunications, and plans gone awry. My first impressions of the performance: The show’s production and set were perhaps the best I’ve seen from a low budget Residential College Players show. There were full walls and decorations of a 1940s home, creating a cohesive and realistic impression from the first glance. The transitions were smooth and the costumes were wonderful. When (spoiler) the two dead ghost-wives were together on stage in the third act, the effect of their powdered hair and silvery dresses created a distinct divide between the living husband and the dead wives, who had by this point begun to turn on him angrily. Here, the costumes helped push the plot along. The characters were each believable and funny in their own ways. With both moments of poor judgment and wise reflection at different times, they were all relatable and developed, each with a distinct style and personality. Madame Arcati, the medium, was hilariously surprising as she threw around outdated expressions. Ruth was practical and intellectual, Elvira, the first wife, was frivolous and manipulative, Charles was confused and perpetually doling out some lesson or another. Social commentary: The last two acts of the show especially shed light on the relationships between Charles, the husband, and his past and present wives. Throughout the show, Charles often shares advice with his wives, but ironically, hardly handles any situation well. He is patronizing in his interactions and conversations, reassuring Ruth and Elvira like children. When Ruth and Elvira show themselves to be capable and assertive, Charles becomes frustrated that they are too “domineering” and “hag”-like. He consistently claims that they are just jealous of the other woman (and shouldn’t be), demonstrating his particular conception of how women should be and behave. An argument between Charles and Ruth, his current wife, in which Charles complains of how poorly she has handled the situation of Elvira’s return from the dead, is telling. He argues that she should have been a comfort to him in this time of strife, and fails to understand her perspective. Charles ironically presents himself as the victim of the situation, when he was the one who initiated the seance, and his wife is now dealing with the repercussions. This narrow conception of womanhood puts Ruth especially in a difficult position where it is nearly impossible to act uncriticized by her husband. At the end, Charles is haunted by his two former wives, who, untethered by social expectations, finally have a chance to take revenge on the husband who underestimated them.